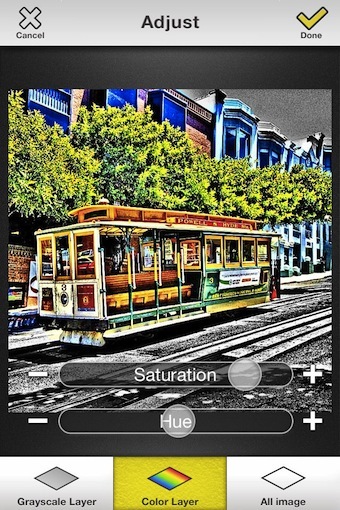 Popular Mac Photo app, Color Splash Studio – Now on the iPhone! While I don’t own Color Splash Studio on my Mac, I have seen it being used around the office. So, when I saw it was available for the iPhone, I recognized the name and jumped in to take it for a spin. The iOS version is for the iPhone only, or can be run in 2x on the iPad, no specific iPad version available yet. If you new to the Color Splash phrase, the process is ‘simple’. You are able to have areas of your photo show as their original color and other areas dropped down to black and white. It creates quite an effect when you have a building with a window reflecting a colorful area… drop out the building and have just the reflection in color. Note, I’m not saying ‘colorized’ since the ability to ‘add’ color isn’t supported. 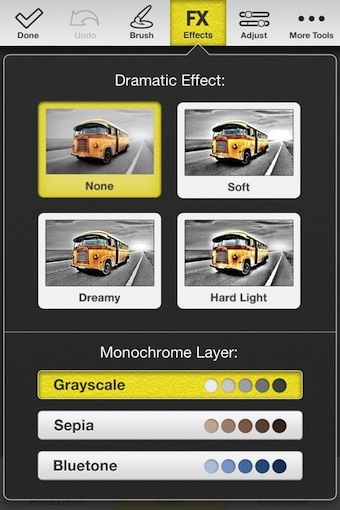 You are only allowing the color areas to either have their original coloring or convert to black and white. For Color Splash Studio, there is also some extra tuning features that are provided to get a bit more out of your photo’s impact on the viewer. 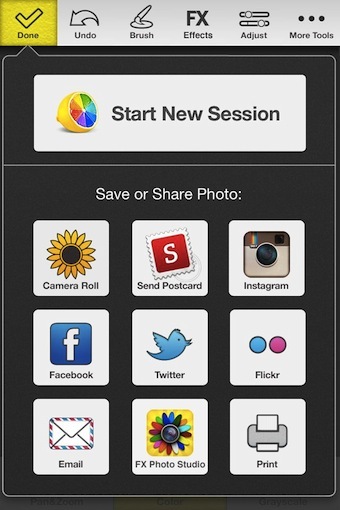 Start by taking a picture, importing from your iPhone photo library or import from Facebook. Crop if needed, then tap next to get into the tuning. You can start right off, but you may want to choose the Brush button to tune the tool you will be using to apply the effect. The next option across the top of the Color Splash Studio work area is FX Effects. The Dramatic Effect adjustments is not something I have seen in other color splash effect apps. Also adjustable is the Monochrome layer. Under the ‘More Tools’ options of Color Splash Studio is another three items I wish more photo enhancement apps on the iPhone had. 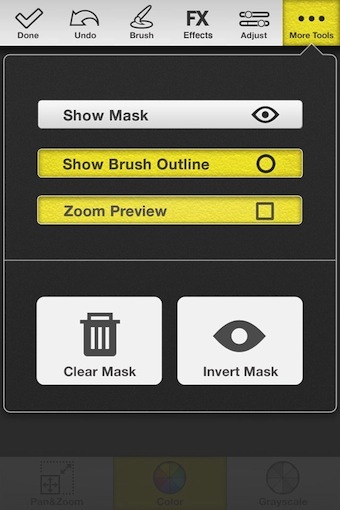 The top one I have mentioned before… “Show Mask”. Making the effected area of a photo much easier to see vs the untouched. A nice feature not seen in other apps is the overlay box showing where your doing your color work. Since the editing is being done under your finger tip, it is often difficult to stay between the lines. The Color Splash Studio’s box makes it much easier to get the job correct the first time. The box jumps to the other side of the screen when you start editing near it. You still have the option to pan/zoom via the button at the bottom of the screen. As well, you can ‘un-color’ an area you didn’t mean to have the color show by using the Grayscale button and coloring black and white over it. I waited till now to mention the Saturation and Hue adjustment since you need to see it over a tuned photo. The tool is found under the ‘Adjust’ button across the top of the work screen. 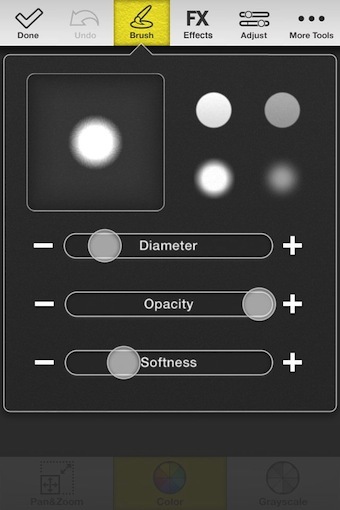 The two sliders can be used for the Grayscale or Color layers individually, or the full flat image. The final touched up image is at the full size/resolution that you imported and started with. 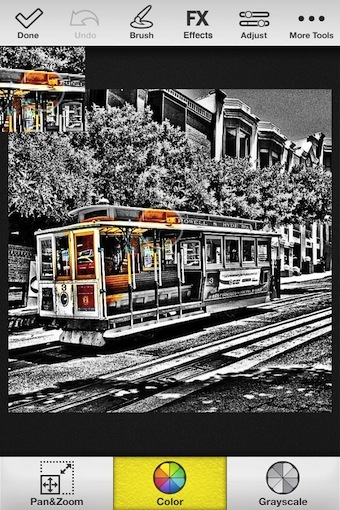 Color Splash Studio offers a nice selection of options for sharing your finished work too.